To reflect its popularity in NASCAR, Chevrolet produced a limited number of Monte Carlo SS Pace Cars in 2000, 2001, 2002 and 2003. These highly optioned vehicles included many unique features such as two-tone paint and a handsome graphics decal package with Silver, Checkered Flag, fade pattern stripes, Taz logos and "Team Monte Carlo" rear spoiler decals. Because only 6,073 were produced, these cars are rare and sought after. 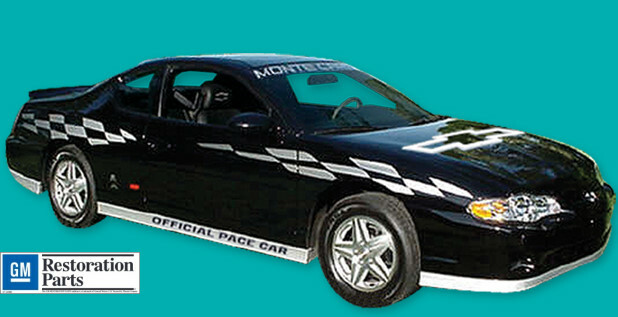 Our 2000-2003 Monte Carlo SS Pace Car decal kit is manufactured to meet or exceed OEM specifications and includes everything needed to restore your modern American classic back to a factory fresh appearance! These kits also fit all 2004, 2005, 2006 and 2007 Monte Carlo vehicles.